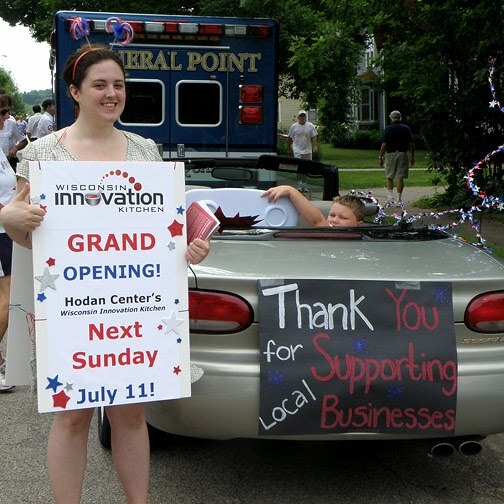 The Grand Opening of the Wisconsin Innovation Kitchen is next Sunday, July 11. I've been working to hone down the introduction of the facility to something useful that people can use to take action steps. • A new 10,000 square foot commercial food processing kitchen at 851 Dodge St., Mineral Point in Iowa County, WI. Opening July 11, 2010. • Owned by the Hodan Center, a center supporting adults with disabilities. • Their food lines, sold under the Papa Pat's Farmhouse Recipes brand, are sold in more than 700 stores in 26 states. • Their new kitchen to be shared with food businesses and food entrepreneurs and the wider community. • State-inspected, community-shared commercial kitchen strategically located at the heart of 35 million people. • Only community shared kitchen in the U.S. with professional food processing staff available. • The Innovation Kitchen staff can provide all services needed to professionally prepare recipes for commercial sale. Services include, purchasing, preparation, processing, packaging, labeling, storage, distribution, as well as in-house business, marketing and sales support. • With appropriate certifications Innovation Kitchen Partners can rent the Innovation Kitchen on an hourly basis to process their own recipes. • Four separate preparation process can be carried out simultaneously: baking, canning, dehydration, and dry mix production. • In-house business support is available through our Entrepreneur In Residence program. 1. Existing food businesses can grow their enterprises and create new jobs using shared infrastructure, equipment, and services. We help others grow and create jobs. 2. New food businesses can startup affordably in a state-certified commercial kitchen. We have Partner programs to support most kinds of business startups. 3. Non-food businesses and organizations can support their own businesses as well as local foods. We can private label local food products using your brand and logo. Partners create mutual support and benefit. 1. Preparation Partners. The Wisconsin Innovation Kitchen prepares your recipe for you. 2. Processing Partners. You prepare your recipe in the Wisconsin Innovation Kitchen. 3. Event / Education Partners. You produce a food related special event utilizing the Wisconsin Innovation Kitchen. 4. Purchasing Partners. We provide ingredients, packaging and related food processing materials for Partners working in the kitchen or Partners in the community needing commercial quantities of food grade supplies for their own operations.